Nations Press news VIRAL: Woman Gave Birth Aboard CebuPac Flight! 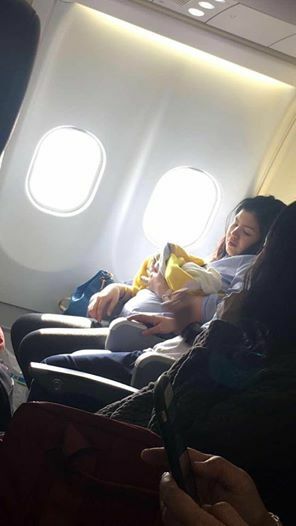 VIRAL: Woman Gave Birth Aboard CebuPac Flight! A "normal" flight turned extraordinary after a passenger of a Dubai Cebu Pacific flight bound for Manila suddenly gave birth on the plane. Plane passenger Missy Berberabe Umandal recounted how the "normal" flight became a memorable one when a co-passenger started having contractions mid-flight, while they were still five hours away from the Philippines. "Flight attendants started calling for medical assistance, and luckily, there were two nurses among the passengers. She was already crowning, so she was brought to the more spacious area in front of the plane," Umandal said in a Facebook post, which is now going viral. "We only heard one semi-loud screech, and a few seconds later, there were tinier, cute screeches, and it was when we knew the baby was born. Luckily, she [passenger] only had to push once," she added. The passenger reportedly returned to her seat after giving birth. Another passenger provided infant clothes to the newborn, a baby girl. "One of the passengers had a suitcase full of infant clothes and necessities, which could not have come at a better time. They had a sterilized shelf filled mineral water as a makeshift wash basin to clean the baby in," Umandal added. The contractions came as a surprise to the pregnant passenger, as she was expecting to give birth by October, Umandal claimed. Umandal claims the baby will be given free Cebu Pacific flights for life. Cebu Pacific has yet to confirm this but such is a tradition in many airlines around the world.